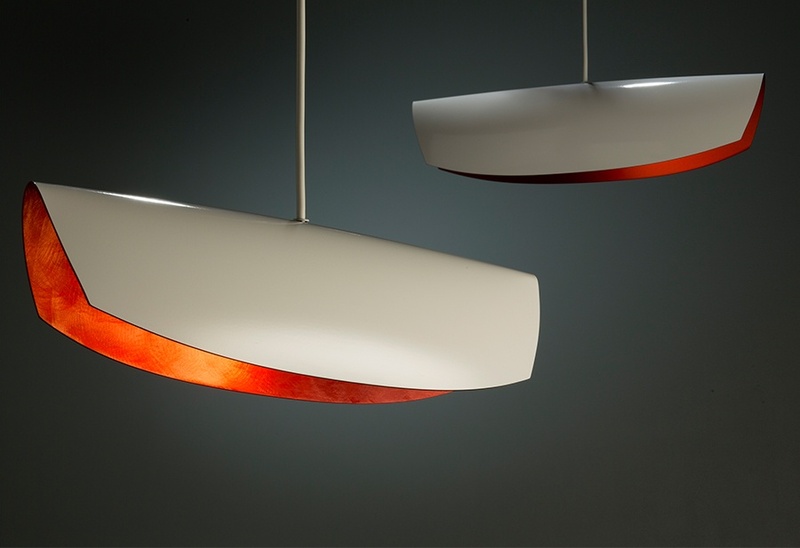 The Orime pendant light is a design collaboration between Robert Foster and Bengt Cannon. The name Orime is taken from the Japanese word for “fold” and is a gratifying shape reminiscent of nature and oriental architecture. Though the light emanating from the shade is predominantly white, the reflected light from the inside skin is rich red which imbues space with a warm and romantic mood. The shape of the shade is designed to produce a long stream of light that is particularly suitable over dining tables or kitchen counters and benches, illuminating a specific area whilst shielding your eyes from the globes light source. Materials: white powder-coated outer and red anodised aluminium inner, LED globe.